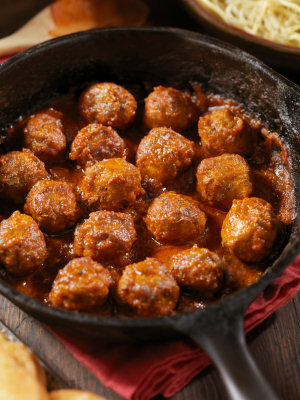 Welcome along to MeatballRecipes.net - the great website for all your favorite recipes for meatballs. To view a recipe from our collection, please click its title from the list provided below. Enjoy! Beef recipes collection - Great ways to eat this tasty red meat. Crab recipes collection - Popular seafood servings making use of this edible crustacean. Goose recipes collection - Traditional Christmas roast and many other poultry options. Pork ribs recipe collection - Barbecue, Chinese, Cajun and more styles of rib. Shrimp recipes collection - Splendid seafood. Spanish recipes collection - Cuisine from Spain including paella, tapas and more. Turkey recipes collection - Great ideas for how to cook your bird, in the holiday season or otherwise. Venison recipes collection - Lower in fat than many other meats, venison is both delicious and healthy. This is what you think of when you hear the word meatball. A tender meaty globe perfect for use in a basic tomato sauce over spaghetti noodles. This is also a great recipe for freezing the extras and using them later for a quick dinner. Makes 30 meatballs. Average rating 4.33 stars based on 3 reviews. This Scandinavian classic, well known from being served in the cafeterias of IKEA furniture stores, combines ground meat and seasonings, served in a creamy sauce, is a delicious meal for all the family. Serve with mashed potatoes, pasta or noodles. Average rating 4.67 stars based on 3 reviews. Average rating 5.00 stars based on 1 reviews. Very good and easy to make. I mix beef and turkey and worked out great! I'm making them again tonight again for my family!! Better then the ones from the grocery stores and healthier. Thank for you sharing! Just made the meatballs. Very easy. My little one does not like chunks in his meatballs so this was just right recipe. Thank you for sharing. I cut the recipe in half, wound up with 8 delicious meatballs. Made them for my grand daughter. Very good and really easy.. I made my meatballs with a little bit of shredded cheese in the mixture for a little more flavor, but I want to mention that I made my meatballs a little bit bigger than called for and the same cooking times were still perfect for that size as well.